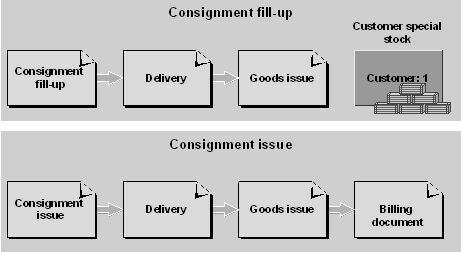 In SAP, Consignment stocks are coming under MM-IM (Inventory Management) module.Consignment stocks are special type of stocks that are stored at customer location and owned by the vendor itself. Later the customer can own the stocks or can return to the vendor. See the Tcodes , tables and PDF tutorials related to this. Consignment stocks also reflected in the total available stocks of the company.We need to create a special stock partner in the system to deal with this type of stocks. Consignment stock data in SAP are mainly integrated with MM, SD and Logistics modules. There are two types of consignment stocks.Vendor Consignment & Customer consignment. Vendor Consignment stocks : Stocks are stored in your company but still vendor is the owner of that stocks.It is marked as item category K.Data is stored in MKOL table. Customer Consignment stocks : Stocks are stored in your customer shop, but still you are the owner of those stocks.It is marked as item category W.Data is stored in MSKU table.